New York, NY, October 20, 2018 --(PR.com)-- In less than a year, 6AM Run LLC has taken the running world by storm. While they began formulating in late 2017, and early 2018, they only recently went to retail this summer June 1st, 2018. Their unique formulas have became huge in the industry, allowing distance runners extended natural energy using their healthier, and minimum Green Tea caffeine, combined with 12 unique Aminos for fast recovery. Their next best selling line Sprint, a “Pre-Run,” has seen almost every distance runner PR at their top events. Without the gassy, bloated, bulky feelings other pre-workouts cause. They also offer a cleanse, joint formula, and stylish running gear. “Today it is with great pleasure we announce we will be debuting our largest booth ever, on one of the largest running stages, the TCS, NYC Marathon Expo, at the Jacob Javits Center on Nov, 1st!” CEO Hami Mahani said. This will be the first major marathon, and expo for the extremely new company. They have spent the summer supporting many charitable 5K’s through the tri-state area. The expo is November 1st, 2nd, and 3rd. 6AMRun.com will be at Booth #614. “In less than six months, we have grown so fast. We have 10 customer runners who are running this event! It is close to our Wilmington, DE HQ, and it is just time. We slowly rolled out our supplements in the peak of running season, the summer, and after seeing our testing, results, and most importantly over 80% returning consumers for their refills, we feel it is time to set the stage for 2019 starting in NYC Nov. 1st,” Mahani said. 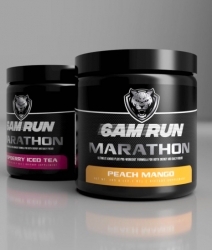 6AMRun is one of the first companies to create a sort of Pre-Run all in one supplement, known as “Marathon.” It uses a natural Green Tea for caffeine, and 12 unique amino acids for lean muscle building and recovery. There are no effects of bulk, bloating, or gassy feelings like many other pre-workouts with heavily concentrated chemicals. Look for the 6AM Run Booth on November 1st, 2018 in New York. Their Booth number #614, at the Jacob Javits Center, NYC.